KIEV, Ukraine -- Ukrainians were on high alert on Saturday after a series of explosions occurred in the south and west of the country, killing two people. 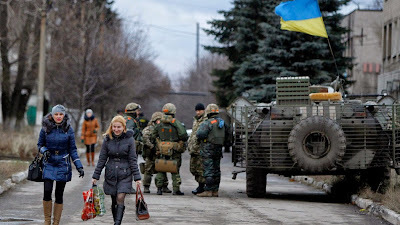 Women residents pass by a group of the Ukrainian government army soldiers in the village of Debaltseve, Donetsk region, eastern Ukraine Wednesday, Dec 24, 2014. Peace talks aimed at reaching a stable cease-fire in Ukraine between its government forces and pro-Russian armed groups began on Wednesday in Minsk, Belarus, with the discussions to include a pullout of heavy weapons and an exchange of war prisoners. One person was killed in a blast overnight in the southern port city of Odessa, according to local police officials. Later, an explosion occurred in the southern Ukrainian city of Kherson, killing one man, authorities said. The injuries sustained by the unidentified victim in Odessa indicate that he had dealt with explosives, Volodymyr Shabliyenko, a spokesperson for the Odessa regional police department, wrote on Facebook. Kherson police said the blast there occurred before noon, local time, on Saturday after a man wearing an explosive device entered the currency exchange and detonated it, killing himself. Meanwhile, in Lviv, a rocket-propelled grenade was fired at the home of the city’s mayor, Andriy Sadovyi, a prominent official whose party placed third in parliamentary elections in October, according to the Interfax-Ukraine news agency, citing Svitlana Dobrovolska, a spokesperson for the Interior Ministry's branch in Lviv region. No one was injured in the Lviv attack, as Sadovyi was away on vacation. A similar incident occurred at the mayor's home on July 26. Footage from a security camera caught the blast amid a snowstorm. The motive behind the attacks remains unclear. However, a top Ukrainian security official told Mashable by phone on Saturday that he believes "pro-Russians" or Russian agents" carried out the attacks to destabilize the country, and “incite fear” among the population. However, since the alleged attackers have not yet been identified or captured, he said he “could not say with 100% certainty” that this was the case. "But evidence so far points to this," he added. Two senior Ukrainian security officials previously told Mashable in separate interviews that they had evidence proving Russian agents are using subversive tactics to carry out covert operations in several regions of Ukraine to destabilize the country. They both pointed to the assassination of Kremenchuk Mayor Oleh Babyev and attempted assassination of Sadovyi in July as evidence of the type of operations these agents are tasked with conducting. Those officials also said that the proliferation of weapons had sparked a rise in attacks, as well as in black-market arms sales across Ukraine. The weapons, they said, are spilling over from the conflict zone in the country's east. 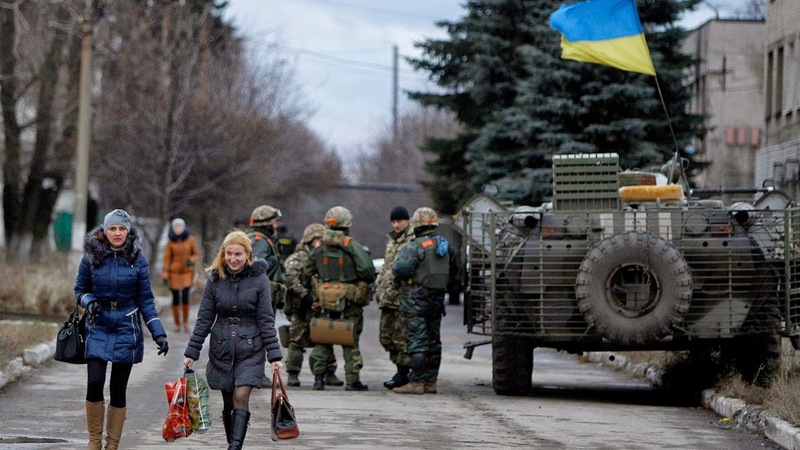 Most make their way deeper into Ukraine, while some are sold and sent to central European countries, they added. “We have reason to believe they are also being trafficked through ports en route to Turkey and northern African countries,” one official said. The Security Service of Ukraine (SBU) seizes illicit arms on a near-daily basis, including shipments in and out of the country. Experts Mashable interviewed also believe Russia is behind many of the attacks, which they say are meant to reassert influence over Ukraine, much of which was lost after the Euromaidan revolution toppled former Moscow-friendly president Viktor Yanukovych in February. On the heels of his ouster, Kiev’s interim government moved quickly to solidify its relationship with the European Union, inking the very political and trade accord that set off the revolution last November, after Yanukovych spurned the deal at the last minute. In doing so, it also diminished Moscow’s power over Ukraine. Moreover, the country's move this week to cancel its non-aligned status, allowing it to work toward NATO membership, infuriated Russia. Moscow said on Wednesday that NATO was turning Ukraine into a "frontline of confrontation." Olexiy Melnyk, co-director for Foreign Relations and International Security Programs at the Kiev-based Razumkov Center, says he is concerned about violence from Ukraine’s war-torn east spilling over into other regions. Melnyk believes pro-Russian rebels have snuck through Ukrainian military lines, and are operating “from south to north to west” Ukraine. “That’s already a fact,” he told Mashable. The SBU itself has openly admitted that Ukrainians will be living under constant threat of terrorist attacks for years to come. In August, Ukraine's Defense Ministry began drawing up a program to train military personnel for guerrilla, sabotage and intelligence networks, according to the ministry's press service. Defense Ministry experts and General Staff of the Ukrainian Armed Forces were tasked with drafting the strategy, which is expected to begin training by the end of this year, the ministry said. "Moscow said on Wednesday that NATO was turning Ukraine into a "frontline of confrontation." Let me see if I understand this correctly. Moscow has been planning - since 2008 - the take-over of Crimea and Putin's fantasy of a Nova Rossiya. In March of 2014 these plans are activated and Russia - without the slightest provocation - moves aggressively against Ukraine. And that, of course, translates, in Moscow's alice-in-wonderland jargon, into NATO's "turning Ukraine into a frontline of confrontation". I'm waiting to hear from Russian astronomers that the moon is, in fact, made out of cheese.